The real beauty of WordPress is its flexibility and easy to use. Recently, a more robust way of building WordPress websites has been landed in the market and is crowded with a lot of WordPress tools aka. Plugins called Page Builders. A Page Builder is a tool that upgrades the default WordPress content editor to a Page Editor. You can then visually design your own theme and pages from scratch. In basic terms, page builder is a tool to craft a website or page out of your dreams block by block, element by element. To be very honest, I had never fallen in love with any of the Page Builders due to their markups, additional CSS files and a gross tangle of code. However, Recently, I come across a great WordPress Page Builder Plugin “Beaver Builder” that’s risen high above my usual developers disdain. Beaver Builder is a WordPress Plugin for developers, designers and do it yourselfers to craft and design their WordPress sites using this drag and drop plugin. This thorough Beaver Builder Review can be of your interest if you are looking for a way to craft a custom WordPress site from scratch or want to upgrade your existing site’s design. 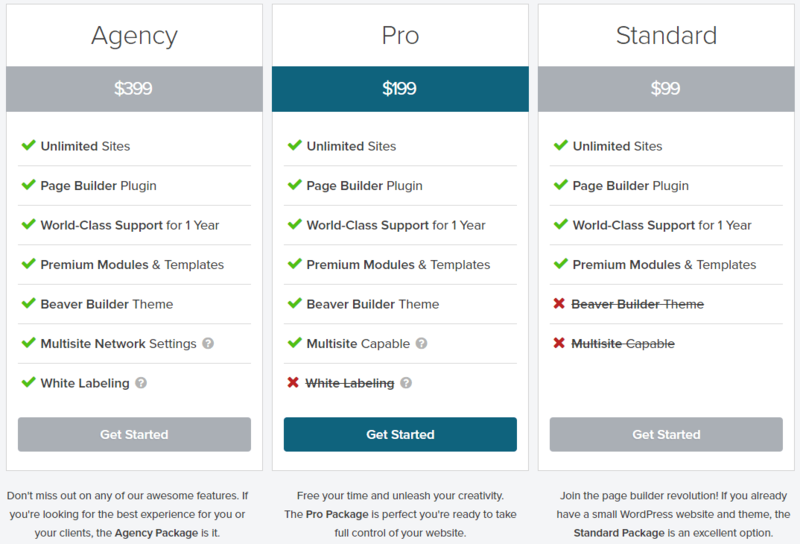 There are many premium and free Page Builder Plugins available in the WordPress market, but Beaver Builder is considered as a leader among many top developers like Carrie Dils and Chris Lema. In this review, we will look at the following factors related to Beaver Builder Plugin. We will try to wrap up everything regarding Beaver Builder Plugin by the end of this post, so you will be able to decide whether Beaver Builder is the right tool to build your website or not. The first section of Beaver Builder Review revolves around the features of this handy plugin. Here we will discuss the features of Beaver Builder Plugin in detail. Beaver Builder comes with a lot of pre-built page templates. You can kick-start your project by implementing dozens of templates to your projects. This will not only save your time but also help in learning how Beaver Builder works. You can take a step further by saving your own custom designs as templates and reuse them again on all of your sites or client sites. Here comes another reason for writing the Beaver Builder Review as the plugin comes with column-based layouts. You can easily control width, sections and almost all aspects of a web page. One of the most phenomenal features of Beaver Builder is its backward compatibility with WordPress. You can switch between themes without the fear of losing content. Even if you disable beaver builder, your content will remain intact in the content editor which makes this plugin the most robust in the market. The Pro and Agency Packages comes with a distinction of having a free theme “Beaver Builder“. The Beaver Builder is simple, clean and yet powerful theme. It supports live editing via WordPress customizer along with many impressive features. The code is clean without any errors and is compatible with the latest version of WordPress. Further, it works across all browsers and is very efficient. Beaver Builder does impact a little on speed but in milliseconds. However, if you do proper optimization of the CSS via minification and combining scripts, it will not impact on site’s speed. The Plugin is almost the leader in this regard among its competitors. Beaver Builder is very flexible, and its functionality can be extended via different extensions. Here are few of them. The Beaver Builder Plugin is little expensive but completely worth the price. There are three different plans are available. Beaver Builder team is excellent and is gladly providing a refund within 30-days of purchase if it does not work out for you. Further, Beaver Builder offers a 40% discount on all renewals. The best part, you don’t need a Beaver Builder coupon to avail the discount. Simply renew it and it’s all done with 40% OFF the regular price. The most beautiful thing about this excellent plugin is its team developers. Beaver Builder has a perfect team of professionals for providing industry-standard support to its users around the clock. The Plugin comes with a complete documentation which can be accessed here. Beaver Builder is a WordPress Plugin that is used for crafting websites from scratch without any coding knowledge. Beaver Builder is considered as a leader in WordPress Page Builder Plugins list. As per WPArena Team and myself, We do recommend you to try out Beaver Builder. I believe it will not be a wrong decision and you will not regret it. However, if you want to code sites yourself, then go for it. However, as I said, it is a lot easier and time-saving technique than coding sites. You can further drop your opinions in the comments section below. Thanks for the suggestion. That’s the tricky part. If I knew what the problem was, I’d know what to ask. Overall, to me, it’s like kneeling before a huge pile of jigsaw puzzle pieces thrown across the floor. Moving one piece in the front end may or may not appear to have an effect, and after I wrestle with that, I discover too late that pieces in the backend have moved to undermine everything. Since I left my original comment several months ago, I’ve still hung in there, watched countless videos, and asked pros for help on it. I haven’t been successful at a single page. I’ve tried all kinds of tutorials but they’ve not been helpful. They always have menus or options that don’t appear in Beaver Builder. We bought the topline package of BB for multiple sites. Maybe that makes a difference? I think I’m gonna have to face the music to ditch the blog idea and figure out another route. Thanks for the suggestion, though. I appreciate it. I’ve tested the free version on GeneratePress theme and found that many Syntax Highlighter plugins do not work when using shortcodes via Beaver Builders. Syntax Highlighter Evolved, Code Colorer, Crayon and Syntax Highlighter are a few that do not work within the builder, but do using the standard WP editor. This is the same for Elementor. Visual Composer works without issue, but is very slow. I am new to these topics try to understand it, information which you had provided is good. Good information on Beaver Builder. Thank for the article.